In this article, I’m going to walk you through a simple live streaming setup for churches that is quick to assemble and easy to use, even for small or portable churches. I will show you the gear you will need as well as my favorite software for streaming to Facebook or Youtube. Read to the end because I think you find that live streaming doesn’t have to be complicated, and with the right tools you can reach your church community online in a few easy steps. There are a variety of ways you can go about setting up your system. While the setup I’m about to show you works great for my church, it may not work for your church. It all depends on your budget, workflow, and personal preference. I think you’ll still find this article beneficial because along the way I tell you about some alternative options to what you see here. Before I dive into this live stream system, I want to encourage you and the leaders of your church to ask yourself the following questions. Why do we need to stream our worship gatherings? What is the return on investment going to be? Are we doing it because we think we will have the same results as Elevation Church who has thousands of people tuning in every weekend to watch? Is it because we want to check off a box of this we should be doing? Is it because there are people in our church community who genuinely would benefit from the live stream? Will live streams be a crucial part of our churches marketing strategy? If potential visitors see our live stream for the first time, what will their impression be? Do we publish the live stream publicly on facebook or youtube, or do we host it on a private web page where only people who know where to go will find it? I don’t want to dive too much into whether or not your church should be live streaming in the first place, but I honestly don’t want you to waste your time trying to set it up if strategically it doesn’t make sense for you. My friend Brady Shearer with ProChurch Tools has a fantastic video on this topic here. Assuming you are ready to move forward with a live stream system, let’s dive into the hardware and gear that makes this possible. Keep in mind, the system I’m going to show you is for our small church plant. I wanted it to be extremely quick to set up, easy to use, and we only need one camera angle. I’m not going to show you a fancy-pants Multicam system that you’ll find at a megachurch. Here’s a general overview of how a live stream system works. First, you need a computer to act as the hub for everything. It can be a Mac or a PC. Believe it or not, all of my research found that live streaming tends to work better on a PC. But since I’m allergic to PC’s, the setup I’ll show you here uses a Mac. The computer needs a stable internet connection. If you’re serious about reliability, set up a standalone network for your live stream. The next thing you need is a video source. You can use almost any digital camera or camcorder so long as it has an HDMI output. I recommend checking out the Canon Vixia HF R800. Along with the camera, you will need an HDMI capture device to convert that video signal into something your computer can receive. Alternatively, you could use a camera built specifically for live streaming with the USB functionality built in. That’s what I have here in my setup. 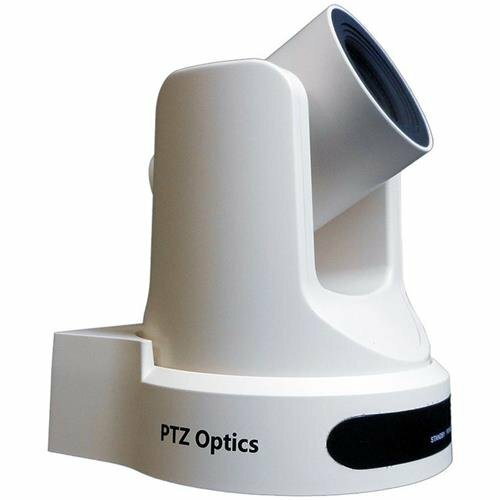 I’m grateful for PTZOptics sending me this to show you. This camera cost $1800, but there are a ton of benefits to it versus using a cheap camcorder. Here’s what I love about it and why I think it’s worth price tag. It’s compact. At our church, we will place it on a tripod toward the back of the room near our sound console. It can be controlled remotely via remote control, and it can also be automated with Ableton Live. No camera operator is necessary. The image quality is excellent. The image sensor has excellent dynamic range, meaning details are retained in the highlights and shadows. The zoom is optical, so when we start zooming in it won't get all grainy like what you would see with digital zoom. It will plug into our streaming computer with a USB cable. There is no need to purchase an additional piece of hardware for video capture. Depending on how far your camera will be from your computer, you may need a longer USB cable than the 6ft one that comes in the box. Ableton Live can automate this camera. You’ll see a video about this on my channel soon. So those are some options for capturing video. Make sure you think through how you are going to mount your camera. Since we set up and tear down every week, we will use a tripod. Maybe at your church, you can install it permanently. Now let’s discuss audio capture. It’s just as important to have high-quality audio, especially when you are streaming worship music. An easy solution is to purchase an inexpensive audio interface like the Behringer U-Phoria UM2. With our setup, I am going to send a Mixbus output from our sound console, the Midas M32R into this audio interface which will then plug into our streaming laptop via USB. Our sound tech will have the ability to create a separate mix for our live stream. That covers the hardware needed for this live stream setup. Now let’s dive into software and how to send you to stream to Facebook or Youtube. I think this is the most challenging part of building a live stream system. There is such a large variety of paid and free options for live streaming software that it makes it difficult for me to give you one recommendation. It also depends on whether you use a Mac or PC. Here’s what I found in my research. If you want to use the free option, then check out OBS Studio at obsproject.com. Overall I was impressed at how stable this software seemed for being free and open source. It works both on Mac and PC. The problem with OBS is that it’s not a simple plug and play solution. Be prepared to watch a ton of tutorial videos and troubleshoot audio syncing issues with this software. For my situation, I simply don’t have time for this. That’s why I would rather not use OBS. If you are a Mac user, I would recommend ECamm Live. This software is plug and play and super easy to use. You can link up your Facebook and Youtube accounts in seconds, and it has cool integration with Facebook live so that someone could monitor the facebook comments from ECamm rather than having to open Facebook in another window. If you are a PC user, I would recommend checking out VMix. I wish VMix was available for Mac, because from what I can tell it looks like the best solution for live streaming a worship gathering. Both Ecammlive and Vmix are paid software options, but in my experience trying to dabble in OBS, the $60-80 price tag is worth saving you and your volunteers a headache. Finally, you will need a Facebook or Youtube account for your church to stream to. Hopefully, your church hasn’t been living under a rock for the past 10 years and you already have those accounts set up. I’ll show you how to send your stream to both. That covers all of the different pieces of a live stream system. To recap, you have video capture and audio capture devices that send your footage and sound to a computer. The computer runs software that will then push the stream to Facebook, Youtube, or a custom RTMP server. Now I want to conclude by showing you how this all works with my setup. I’ve got my PTZOptics camera and my Behringer UM2 interface plugged into my Macbook Pro via USB. I’ll open up Ecamm Live and select the camera and audio interface as my source. Next, I’ll select Youtube as my destination and login to my Youtube account through Ecamm. I can adjust the settings of my Youtube video including title, description, and whether it will be public, private, or unlisted. When I’m ready, I simply press the “go live” button. I highly recommend testing out your live stream in private mode multiple times so you understand how it all works. In the near future, I’m going to bring this setup to church and record a service to share here on the blog and Youtube channel. Since we meet at a high school, we do not have access to reliable internet, so we will just record locally. But one cool thing you can do with most live stream software is playback pre-recorded video files. You could record your Sunday morning service and then live stream it Sunday evening. That could allow you or someone on your team to actively monitor comments and engage with people. Keep an eye on my channel as I will continue to release a few more videos related to live streaming for churches. I’m really excited to automate this camera with Ableton Live, and of course, I’ll show you guys how to do it. If you are a worship tech nerd like me and you want an organized list of all the gear I use in worship, download my worship ministry toolkit. I’ll include a section in the toolkit that outlines all of the gear and software mentioned here.